If you have photos of us, please email them to us! Starting a sound check at the Chabad festival in Skokie, IL. It had just finished raining on everything, including us. 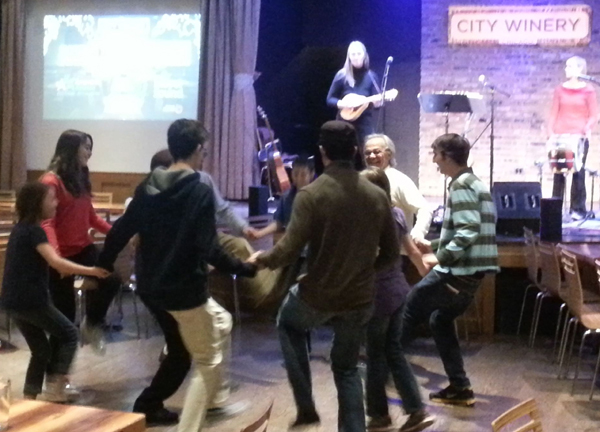 Folks dancing to our music at the City Winery in Chicago while they still had a Klezmer Sunday Brunch in 2013. 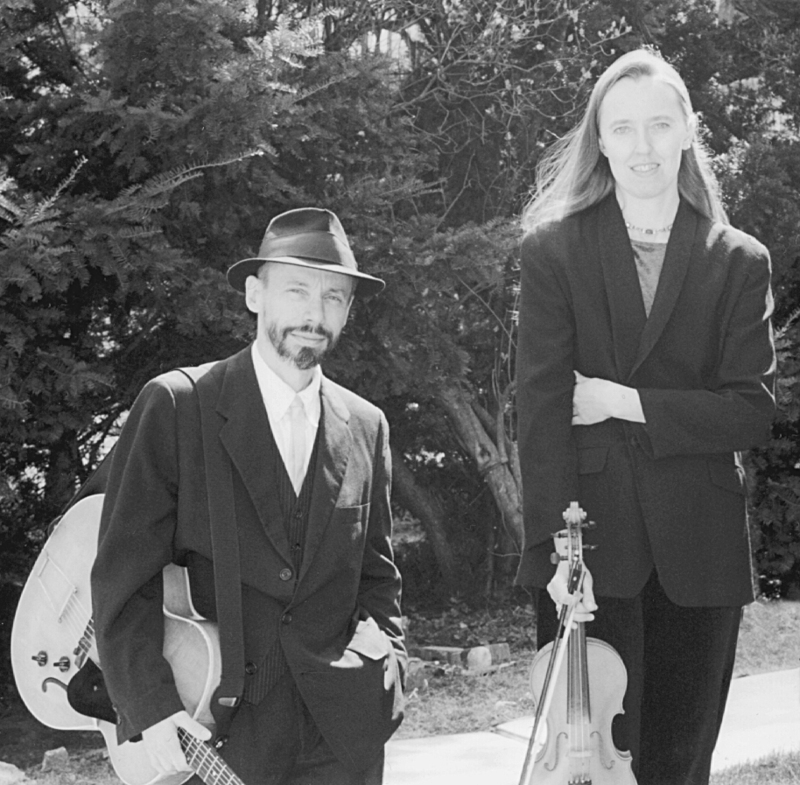 Unloading the car for a gig in New Mexico in 2010. 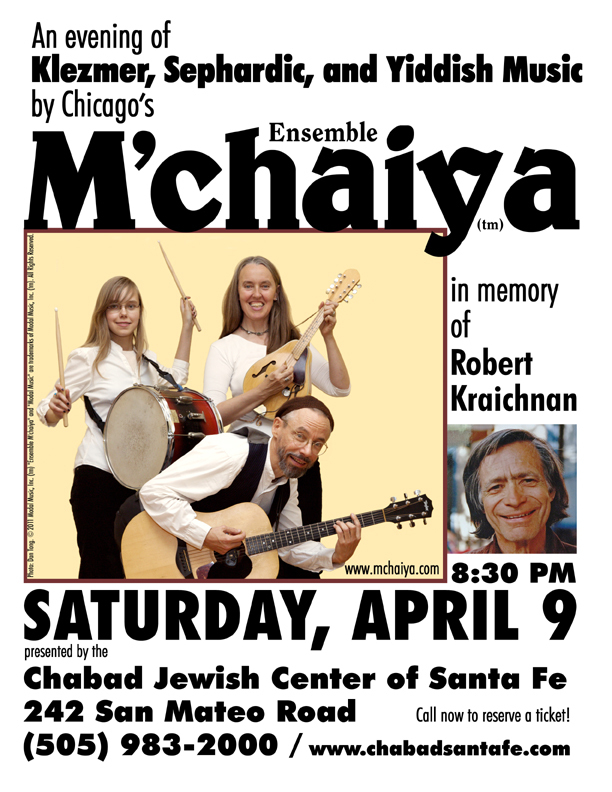 Poster for a gig at the Santa Fe, New Mexico Chabad in 2011. 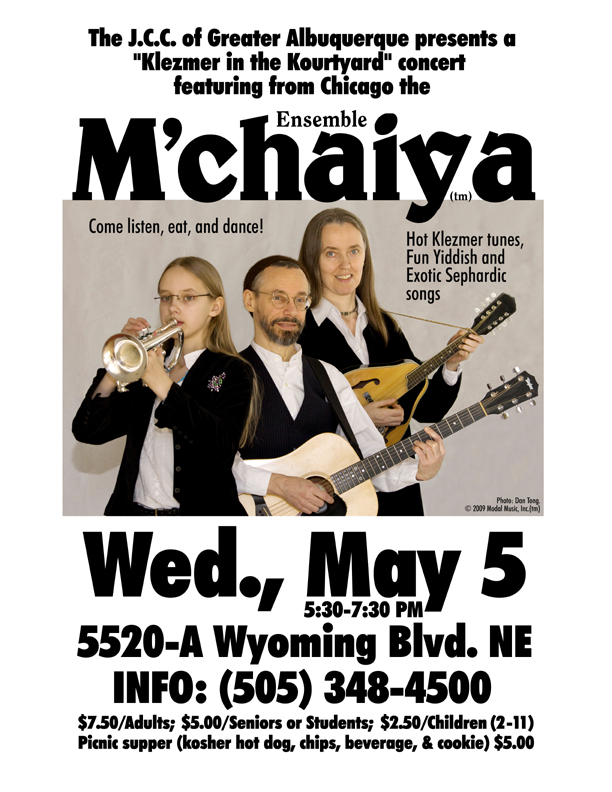 Poster for a gig at the Albuquerque, New Mexico J.C.C. in 2010. 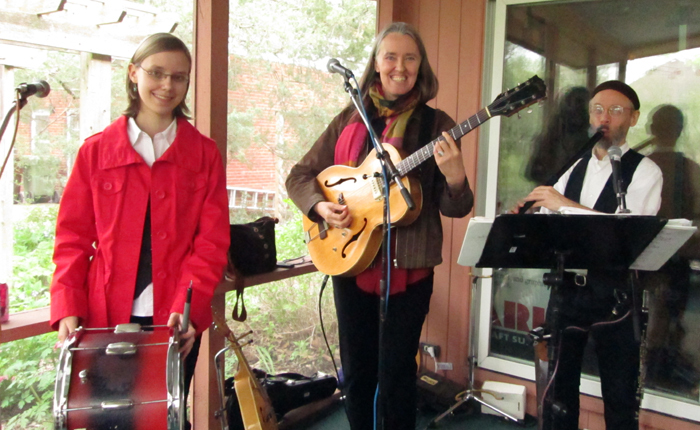 Playing for Caryl Thompson’s 100th birthday May 2013. Caryl Thompson’s 90th birthday May 2003 – same porch. There is a slight size difference in our drummer’s height! 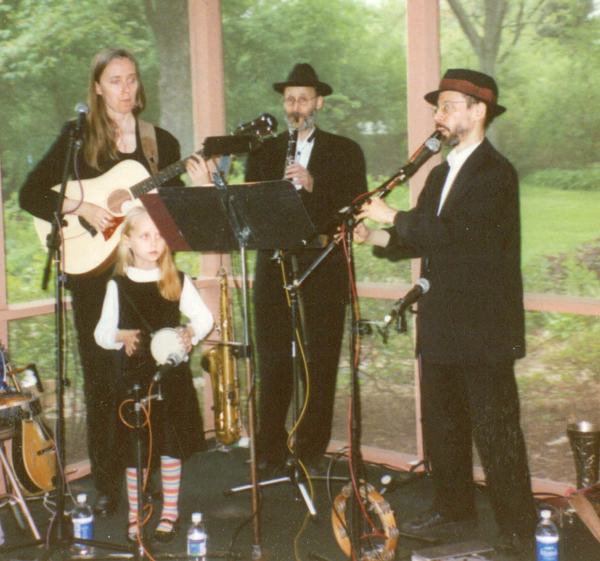 The Chicago Bulls had us play a bunch of times over the years for their pre-game entertainment around Chanukah. 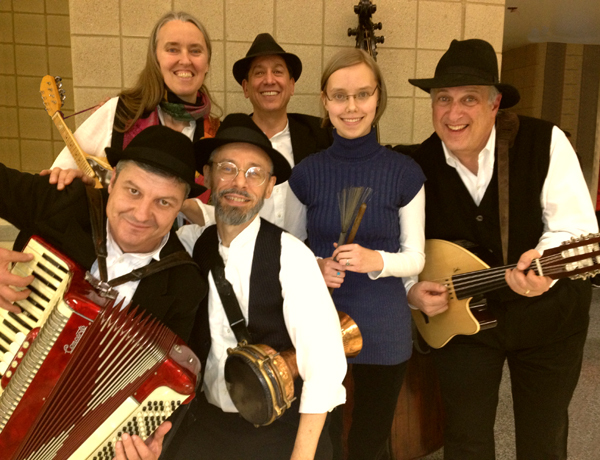 Top photo, from left to right: Steve Hart, Lupcho Kacovski, Terran Doehrer, Zoï Doehrer, Velizar Shumanov, Jutta Distler. Bottom photo, from left to right: Jutta Distler, Bryan Tipps, Zoï Doehrer, Peter Bartels, Steve Hart, Terran Doehrer. Illinois State Fair brought us to Springfield, IL to play there seven times over the years. Setting up the sound system for a private party in Galesburg, IL. 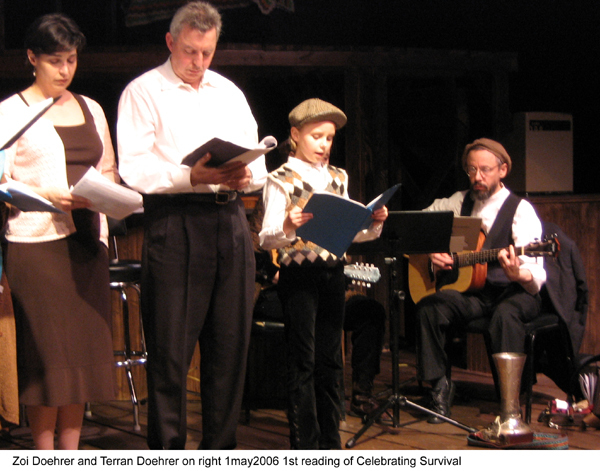 Zoï Doehrer playing a part in a staged reading of Joanne Koch’s “Celebrating Survival”, based on a true story of how a Jewish Greek family survived the Holocaust years. 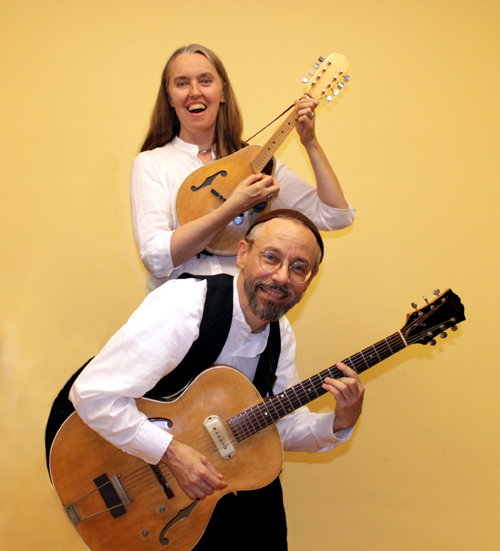 Terran Doehrer is playing the guitar and you can just see the head stock of Jutta’s Mandolin. Poster for a New Year’s concert in Hyde Park on Chicago’s South Side. Click image to download hi-resolution image file. 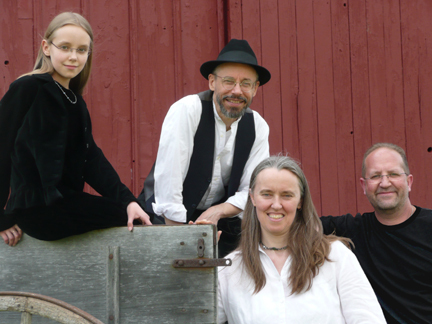 Permission is granted to use these images to publicize events at which the band is to perform as long as the photo credit shown below each image is used in the publicity materials. Permission is also granted to the press to use these images for articles about the band and as part of event listings. For other uses, please contact us for permission. 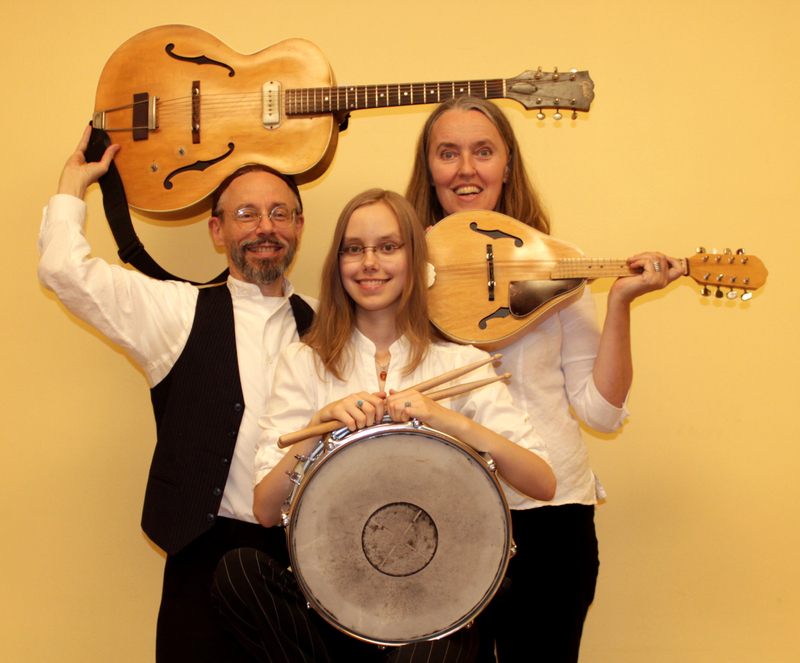 Ensemble M’chaiya (tm): Zoï Doehrer – percussion, Jutta Distler – mandolin, Terran Doehrer – guitar. Photo by Betina Distler. 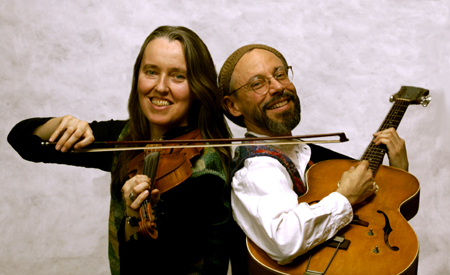 Photo © 2012, Modal Music, Inc. (tm). All rights reserved. Ensemble M’chaiya (tm): Zoï Doehrer – drums, Jutta Distler – mandolin, Terran Doehrer – percussion, George Petrov – accordion, Marc Edelstein – bass, Mark Gavoor – oud. Photo © 2012, Modal Music, Inc. (tm). All rights reserved. Ensemble M’chaiya (tm): Zoï Doehrer – drums, Jutta Distler – mandolin, Terran Doehrer – guitar, Steve Hart – tuba, Peter Bartels – cornet. Photo by Jim Godsey. Photo © 2010 Modal Music, Inc. (tm) All rights reserved. Ensemble M’chaiya (tm): Jutta Distler - mandolin, Terran Doehrer - guitar. Photo by Betina Distler. Photo copyright 2012, Modal Music, Inc. (tm) All rights reserved. 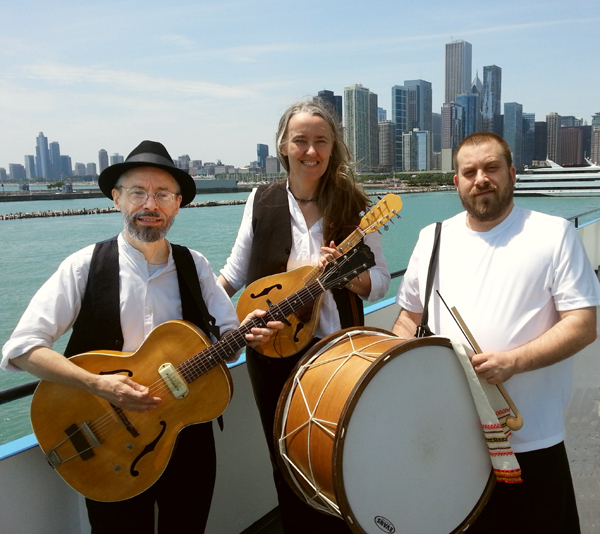 Ensemble M’chaiya (tm): Terran Doehrer - guitar, Jutta Distler - mandolin, Konstantin Marinov - tupan. Photo copyright 2013, Modal Music, Inc. (tm) All rights reserved. 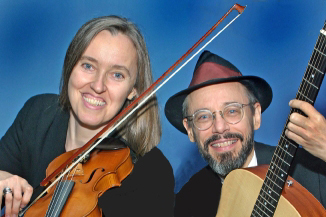 Ensemble M’chaiya (tm): Jutta Distler – violin, Terran Doehrer – guitar. Photo by Dan Tong. © 2007 Modal Music, Inc. (tm) All rights reserved. Ensemble M’chaiya (tm): Back row: Zoï Doehrer, Terran Doehrer; front row: Jutta Distler, Velizar Shumanov. 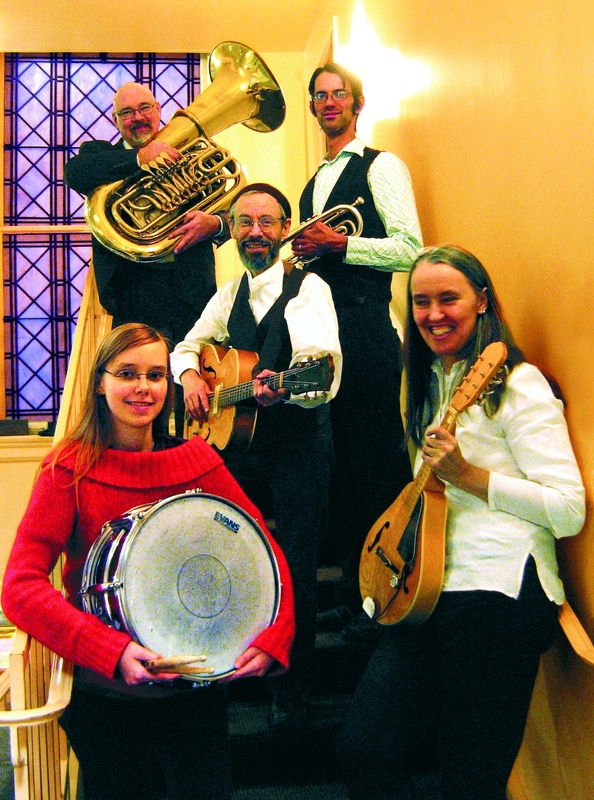 © 2008 Modal Music, Inc. (tm) All rights reserved. Photo by Wally Reichert. © 2003 Modal Music, Inc. (tm) All rights reserved. Photo by A. Richardson. © 1999 Modal Music, Inc. (tm) All rights reserved.